Calling all stoner rockers to the front – the show of your lives is on its way!! 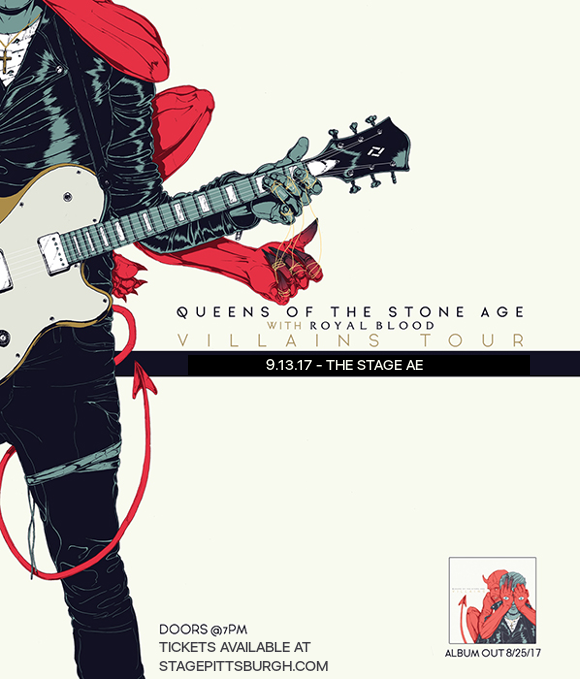 After a 4-year long wait, Queens Of The Stone Age are about to hit the road with their brand new album, and they’ve scooped up British hard rock duo Royal Blood to support them on the way! Coming to Stage AE on Wednesday 13th September 2017 – make sure you’re there, opportunities like this don’t come around every day! Tickets will sell fast, so hurry – book now to avoid disappointment. Formed in Palm Desert, California, by band founder and frontman Josh Homme after his previous band, “Kyuss,” dissolved, the line-up currently consists of guitarist/keyboardist Troy Van Leeuwen, bassist/keyboardist Michael Shuman, guitarist/keyboardist Dean Fertita and drummer Jon Theodore, with almost all members providing backing vocals. Massive from the start, the band, initially entitled Gamma Ray, released an EP featuring musicians from Soundgarden, Pearl Jam and the Screaming Trees, immediately capturing the attention of just about everybody into the genre. Following the release of their first, self-titled album, the band built up a steady fanbase, and went on to release 5 more albums, many singles from which were nominated for Grammy Awards! Now, the legendary hard rock band are on tour with their hotly anticipated new release; “Villains,” set for release August 25th. Listen to the first single from the album, “The Way You Used To Do,” below – and be quick about grabbing those tickets, they aren’t going to last long!